As random questions go, this was up there with some of those uttered from my parents. I was queueing to get some more beer underneath the Sud tribune in Brøndby Stadion when the question was asked by a complete stranger who somehow figured I was English (perhaps it was the socks with sandals combination?). “Do you mean, have I ever seen John Terry?” I had once seen the much maligned Chelsea captain in Huck’s restaurant at Elveden CenterParcs back in 2001 apart from playing for Chelsea and England so I wasn’t lying when I answered in the affirmative. “No, here. He is sitting over there” the women said, waving her arm in a direction that was either towards the Gents toilet or the Main Stand depending on how literal you wanted to be. I hoped for Terry’s sake it was the latter otherwise he’d be all over the front pages (again) for the wrong reasons (again). Depending on which rumour you care to believe, Terry was at tonight’s Superliga derby between Brøndby IF and FC Nordsjælland because a) he’s good friends with club owner Jan Bech Andersen and accepted an invite to pop over as he would not play again this season (or ever) for Chelsea due to suspension, b) he was about to take over as head coach from Aurelijus Skarbalius who had joined a long list of managers who had heralded a new dawn but simply made the club darker or c) he was actually planning on buying out Andersen and running the club himself. There was a fourth reason of course, which was why I was here with Ben. And that is you can’t beat a beer (or three), a sausage (or two) and a good jump around on the terraces on a Monday night. This used to be a regular occurrence for me. For over two years Copenhagen had been my midweek home and instead of spending every night in my apartment watching Kroning Gade (Danish Coronation Street), I went off in search of football. 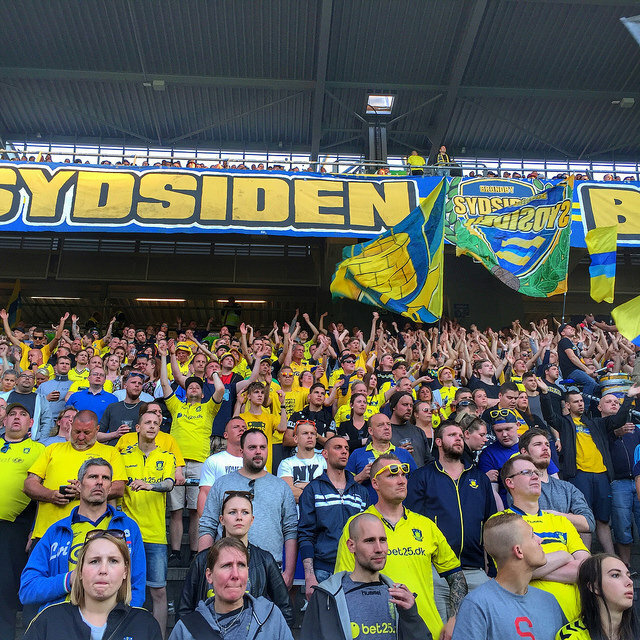 In two years I managed to watch games at 37 different Danish and Swedish grounds but there was nowhere really like Brøndby (OK – apart from Malmö). 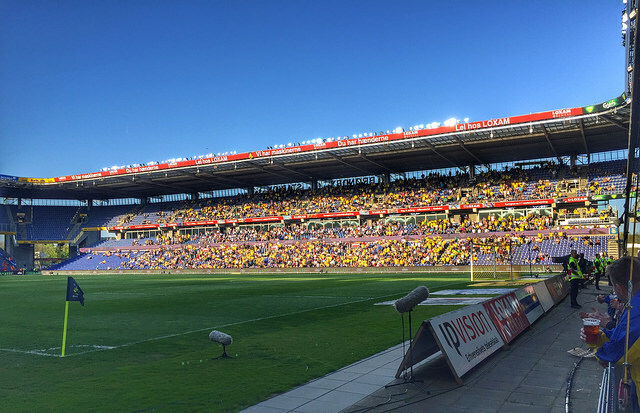 My very good friend and Ultras expert Kenny Legg ranked the Copenhagen Derby played at the Brøndby Stadion as, as he eloquently put it, “F’ing insane” – and he’s a man whose experienced Weymouth versus Dorchester Town (twice!). Quite simply it should be one game that every football fan takes in once in their lives. 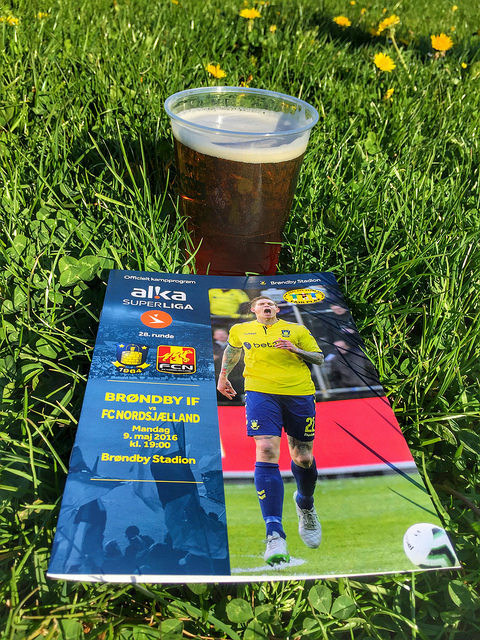 A rare need for a work trip to Copenhagen fortuitously fell on the very day Brøndby were hosting their cross-city rivals, FC Nordsjælland from leafy Farum. 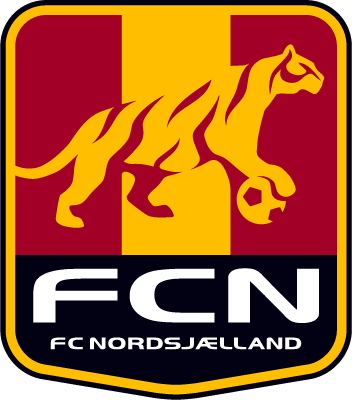 Whilst it’s currently the fashion to talk about clubs overcoming insurmountable odds to win the league (Leicester City were 5000/1 to win the Premier League in case you missed that little fact), we should pause and reflect on the story of FC Nordsjælland who broke the FCK dominance of winning seven of the previous nine titles. Whilst the club had always been respected for its youth development, they hadn’t really made a mark on domestic football in Denmark until 2010 when they won their first major honour, the Danish Cup. A year later they retained the trophy, once again beating FC Midtjylland in the final. However in 2011/12 they led from the front almost on day one and never looking back. Not only did they cap that season with the title but five of their players were called up to the National team. 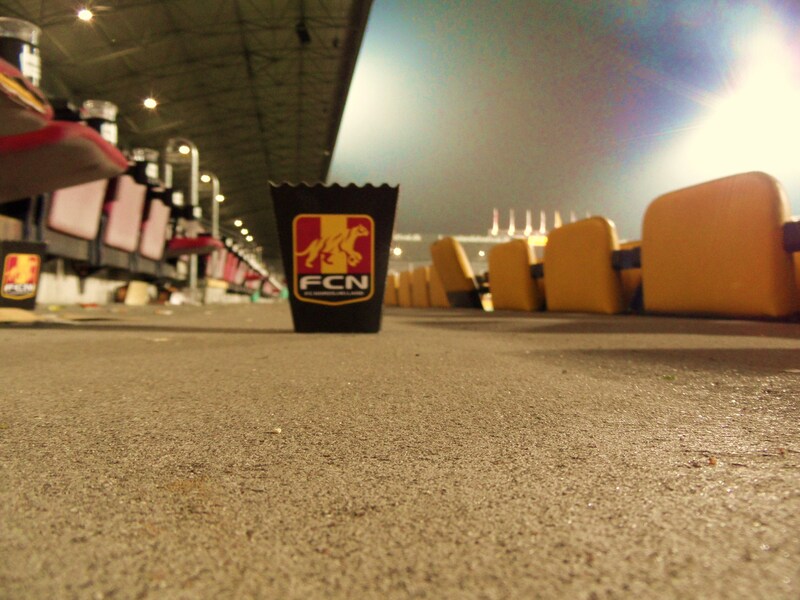 It was always felt that the dominance of FCK on the domestic game, fuelled by perennial Champions League money would never be broken but FCN proved it could be done. Whilst FCK won the title twelve months later (with FCN hosting Chelsea and Juventus in the Champions League ironically at FCK’s Parken), the last two titles have been won by two more “upstarts”. Alas, neither were Brøndby. Last season the story over here, and also back in England, was of FC Midtjylland who again if you believed the media, won the league through the footballing equivalent of card counting. The club, based a few miles up the road from Legoland had been on the fringes of the honours for a while but it took the investment of Brentford owner Matthew Benham and his statistical approach to both recruitment and retention of players to reach that Tipping Point that saw them crowned as champions. But back to today. Ben had procured the tickets for a ridiculous 60DKK (£6) each but failed to remember that we were in Denmark and so a 7pm kick off meant 7pm Danish time, not 6pm that was displayed on Soccerways….Ben has only lived in Denmark for 8 years now. He was quickly forgiven when we took our place at the front of the beer and sausage queue though. He brought me up to speed on the state of play in Denmark’s Superliga. FCK were as good as champions again, holding a seven point league over this season’s surprise package, SønderjyskE. Then came AaB (champions in 2014) and FC Midtjylland (champions in 2015)…and then Brøndby, some seventeen points behind FCK with six games to play. “So the title still isn’t out of the question Stu”. He is a Spurs fan and up until the draw with Chelsea was absolutely convinced Spurs would win the title on goal difference. With only 2nd and 3rd place qualifying for the Europa League and having painfully lost a two-legged Danish Cup semi-final to FCK it looked bleak for a return to European football. That was unless they could get three points tonight. The warm, yellow liquid currently raining down on us reminded us why it’s a bad move to stand at the bottom of the Sud Tribune. 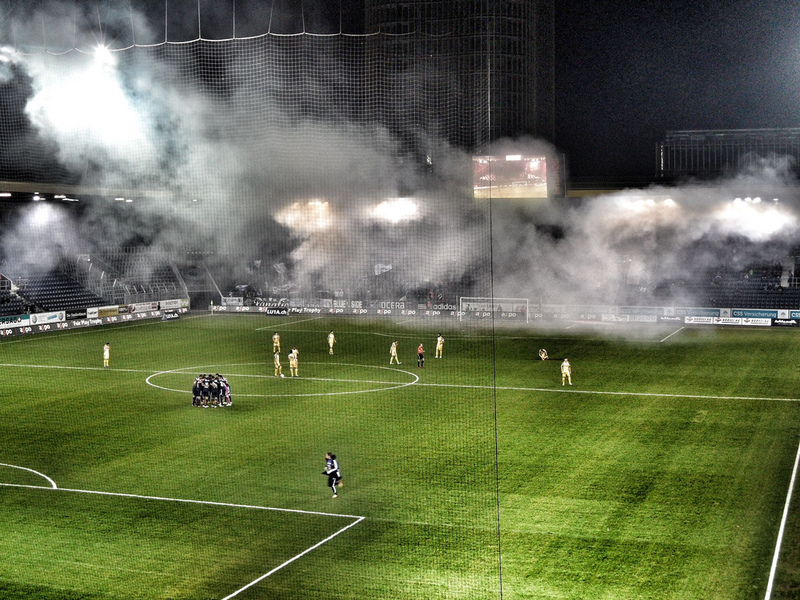 Fortunately the liquid appeared to be beer, thrown in the air to celebrate Kamil Wilczek’s goal. Brøndby had conceded in an all too familiar manner just three minutes before much to the groans of a number of fans around us. A rather animated chap, in full kit with the name “Aggar” on his back tried to show his mate how to clear an attacking ball that had led to Marcondes’s equaliser, using a small teddy bear. She wasn’t impressed and stormed off just as Wilczek’s goal went in. Whilst the game was fairly entertaining, with Brøndby understanding that they key to winning the game was to stop the opposition getting the ball (possession is 9/10th of a win as well as the law), the real spectacle was the fans. It may have been five years since I was last standing on the terraces here but you never forget the feeling of the ground beneath your feet literally bouncing as the fans jumped up and down, sank their lungs out and waved the flags. You cannot fail to be impressed. This was what watching football should be like. Passion. Of course it helped that you were trusted enough to have a beer, although it did seem to be the standard pratice to throw it up in the air when the home side scored. John Terry couldn’t help be impressed by the atmosphere – certainly a little less manufactured some of the grounds in England. He at least won’t have to learn a new language and of course their liberal attitude to the vices means he may stay off the front pages. Then again, it is just as likely that Celtic boss Ronnie Deila will pitch up here in a few weeks once the Celtic gig has finished. The General Manager of the Oakland A’s, Billy Beane, adopted the concept and took his team on an amazing run which then resulted in an approach from Boston Red Sox owner John Henry. Yep, the same John Henry who today owns Liverpool FC. Why is this relevant to the beautiful game? In recent weeks a remarkable story has broken about Brentford’s manager Mark Warburton announcing he will step down at the end of the season. Brentford are currently playing at the highest level in their history, they have a real shot at promotion to the Premier League and a long overdue move to a new stadium is finally on the cards. So why is Mark Warburton stepping down? The reason is the direction self-made millionaire and club owner Matthew Benham wants to take the club. Benham made his cash pile in betting, managing a hedge fund to be more precise before turning his hand to the world of sports spread betting. He employed a team of people to analyse every statistic about clubs and players, and used the results to predict results. Based on his wealth who is to question the success of this approach? The next logical step is to apply the model to his own clubs. Clubs plural as he purchased FC Midtyjlland in Denmark last year. The club, who had have never won a major honour are currently top the Danish SuperLiga using his model. Will this model work for Brentford? FC Midtyjlland’s chairman, appointed by Benham, 31 year old entrepreneur Rasmus Ankersen thinks there is a 42.3% chance of Brentford gaining promotion to the Premier League based on the data they have collected rather than looking at current form and making a reasoned guess of yes or no. 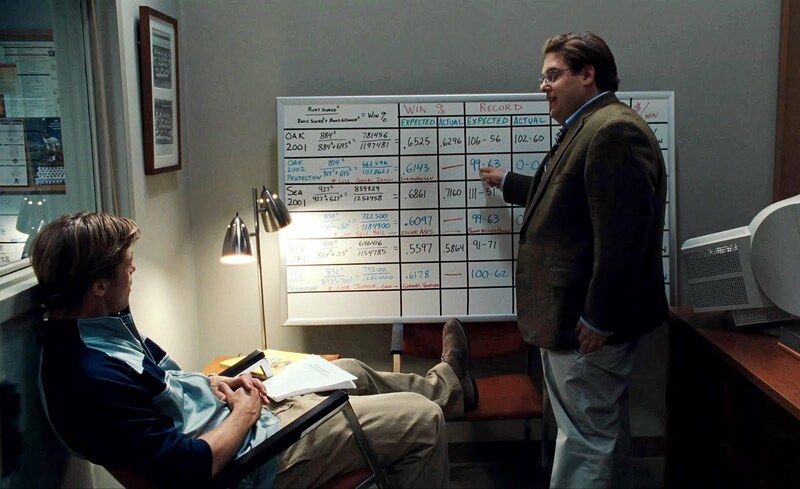 And that, ladies and gentlemen is the theory of Sabermetrics – using past performance and data trend analysis to make decisions about the future. AB…one of the looooong list of footballing acronyms in these parts. Anyone who wants to be taken seriously in these parts needs to complete a University course (free of course over here) in learning your AB from your AaB. In the top league alone we have AaB, AGF, FCK, FCM, FCN and OB. 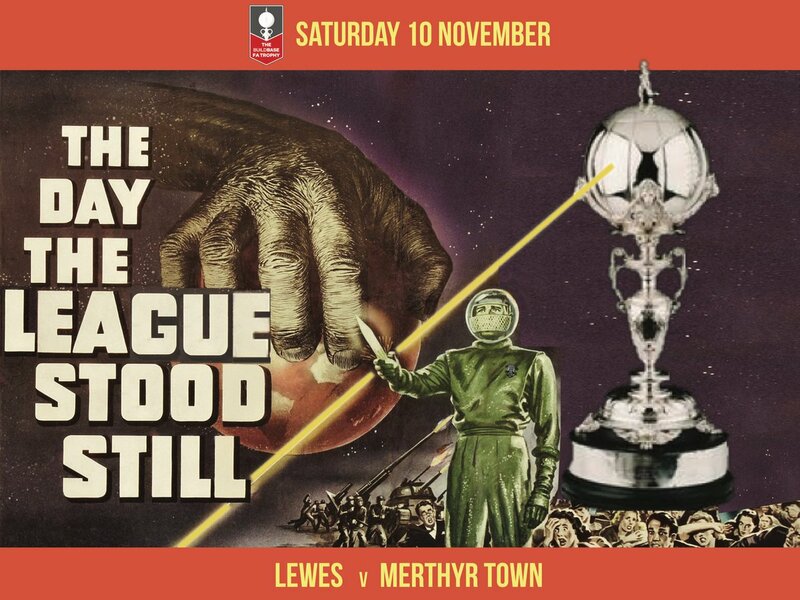 Let’s not even get started on KB, B93, B1901 and B1909 all of whom can lay claim to being league champions in these parts at some point. Tonight is all about Akademisk Boldklub, or the “The Academic Football club”. One would expect the likes of Wenger to one day arrive here, or that there isn’t a boot room rather a library containing works by Jean Paul Sartre, Søren Kierkegaard and Fyodor Dostoyevsky (of course Dostoyevsky). In fact there are few teams in the world that can claim a Nobel Prize winners as former players but AB can, with nuclear scientist Niels Bohr having played between the sticks on numerous occasions when his atom-busting research allowed. 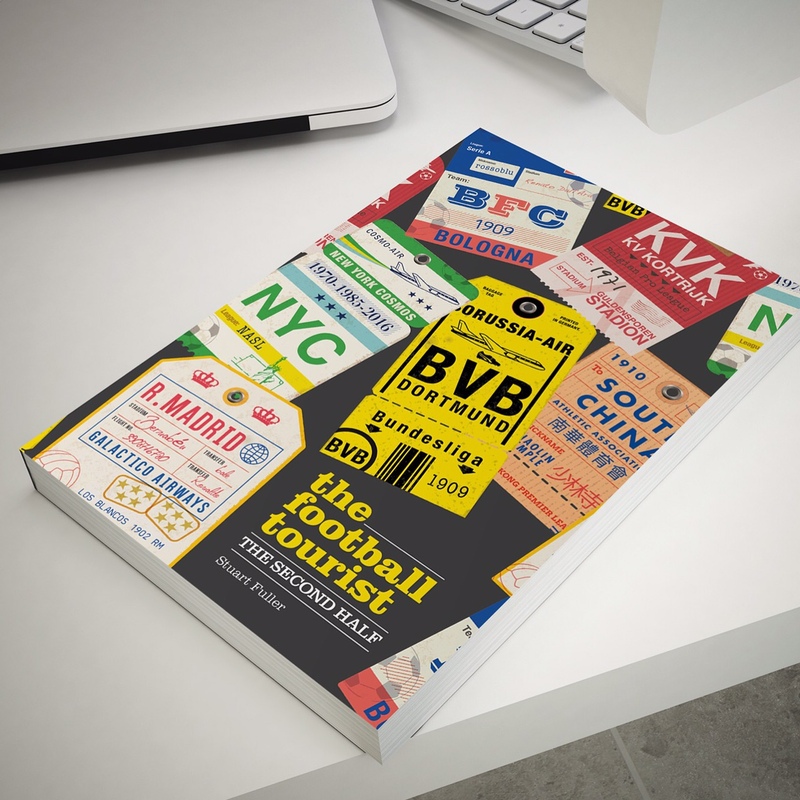 Last season the world of European football was mildly surprised to see a new name joining the Champions League jet-set. Many words have already been written, including our own views, on the miraculous rise from regional cup final to the world’s richest club competition of FC Nordsjælland. Whilst the champagne corks were popping in the Farum, the sleepy northern Copenhagen suburb back in May, there was the usual end of season soul-searching on the other side of the Capital of Cool. Brøndby IF, for so long the title also-rans, had experienced a season from hell, finishing just two places and six points above the relegation zone. Fast forward twelve months and the situation is even more dire. At 5pm today Brøndby kick off against AC Horsens in a “winner takes all” game. A defeat in East Jutland for the blues will see them relegated from the top division of Danish football. For the Brøndby fans, this was another serious kick in the teeth. In the past few years, the big two, or “New Firm” of the Blues and arch rivals FC Copenhagen have seen their power base eroded by the likes of OB from Odense, AaB from Aalborg and FC Midtjylland from Herning. Add to this list the new Superligaen champions, FC Nordsjælland and you can start to feel the pressure that Brøndby are under each season in a league of just twelve sides. But even so, they should be better than a relegation-haunted side. So where has it all gone wrong? Celtic,Rosenborg, Basel, Benfica, Helsingborgs, Rapid Wien, Olympiakos, Liverpool, AC Milan, Barcelona, Brondby, HJK Helsinki, Skendija Tetovo, Buducnost Podgorica, Hadjuk Split and BATE Borisov. But this meeting got me thinking. Which nation are the most passionate about their own domestic league? My new “friend” in the thumbs up Inbetweeners way had claimed the Icelanders were – with just 12 clubs and a population of 328,000 he thought that more people watched top flight football in Iceland as a percentage than any other nation. So in a spare moment (OK, hour) last week I fed all the relevant information into the TBIR super computer to see what the results were. Now, it is hard to be very exact and so I had to make a couple of assumptions. To calculate the attendance of the league I took the league average attendance per game from 2010/11 (or 2011 in case of summer leagues) and multiplied by the teams in the league – this would roughly show the number of people who went to top flight football in a two week period (i.e a home game for each club). The bible for any statistical world is of course European Football Statistics. Obviously there is a small amount of overlap with away fans attending games so I took off 10% from the total to avoid double counting. I was unable to find league attendances for Andorra, San Marino or Malta. In addition there isn’t a league in Liechtenstein as their teams play in the Swiss league. However, the remaining 49 UEFA-affiliated Leagues were included. The results were indeed very surprising. The top ten “most passionate” countries about their own domestic league have an average FIFA ranking of 53 (and a UEFA one of 23). There is only three countries in the top ten that are in the FIFA top ten, and the top three are all ranked by FIFA at over 118, and over 44 in Europe. So in true TBIR Top of the Pops style let’s countdown from 10 to 1.